After a very long day walking around Paris and sightseeing, my husband was ready to call it a day and go back to the hotel to cool down and to rest and relax for a little bit. However, I had one more stop I wanted to make before we could go back to the hotel. There was another chocolate shop that was supposed to be pretty close to the hotel that I wanted to check out. Again, like Pierre Herme, this chocolate shop made the list of one of the top 10 chocolate shops in the world. And because it did so, my husband relented and agreed to go with me to this chocolate shop before we went back to the hotel. 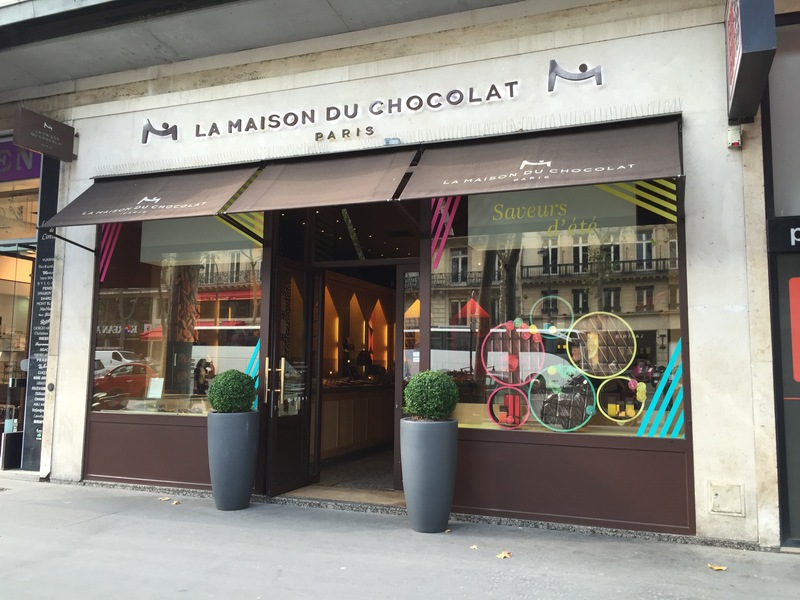 La Maison du Chocolat – Paris began in 1955 with master chocolatier Robert Linxe. Born in the Basque country, Linxe completed an apprenticeship in chocolate in France before moving to Switzerland to perfect his art. In 1955 he opened up his first shop in Paris, called “Marquis de Presles.” In 1977, Linxe sold the store so that he could establish the first Maison du Chocolate shop. The first chocolate shop was set up in what used to be the wine cellar of the shop he had purchased. And it is here that Linxe began to create his chocolate, including taking a huge risk and creating flavored ganaches. 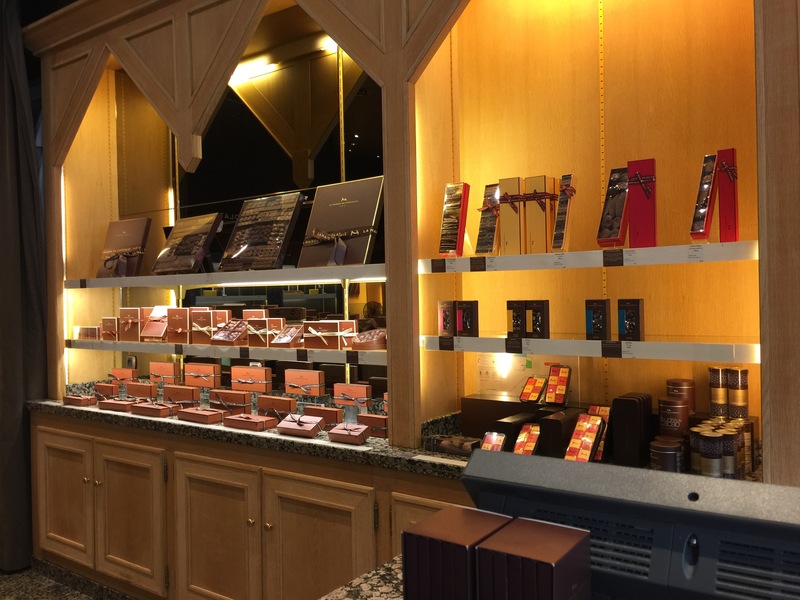 It was his creation of such items such as Zagora, chocolate ganache infused with fresh mint leaves that he was dubbed the “Wizard of Ganache.” Ten short years after the opening of the first store, it is such a success that a second store is opened. Linxe goes on, three years later to create the famous chocolate éclair which is his reinvention of the popular pastry and one of his stores opens in New York. Today, with boutiques that can be found in Paris, New York, Tokyo and London, La Maison du Chocolate is a chocolate force to be reckoned with. Inside the store, it was so immaculately and minimally decorated that it was hard to know where to begin. I think like many boutiques you see in Paris, or even just in Europe in general, it’s all about sleek, minimalistic design. Counters are packed with goods, and shelves are stuffed to full with different product options here in the States, but in Europe it’s a completely different story. Very few goods are actually laid out and presented to customers, so it’s almost as if you already have to know what you want when you walk into a shop. At a chocolate shop, they have just a few pieces of each of their different chocolates laid out for you to choose from, and once someone buys a piece they have on display, only then do they replace it with supplies they have kept behind the counter. 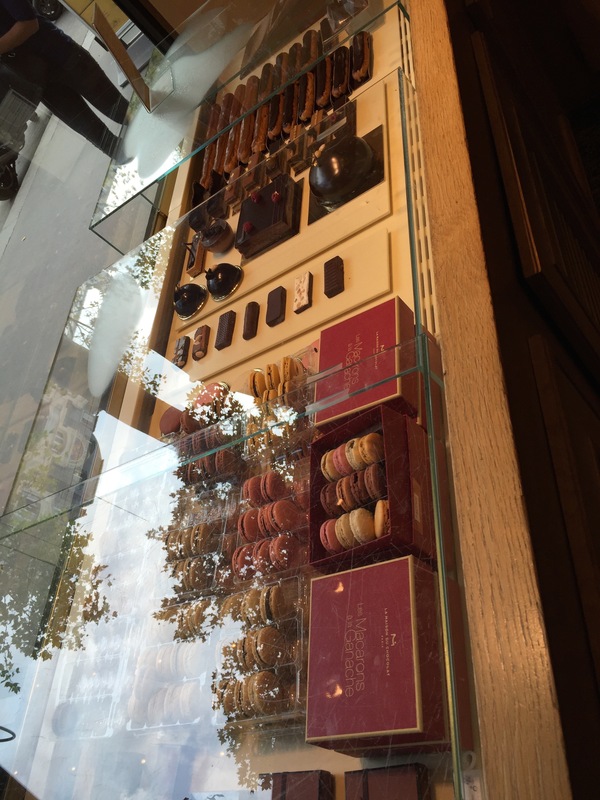 One of the first things we saw when we stepped into the store was a small display of La Maison’s selection of French macarons. They were selling their macarons by the piece or you could make boxes using combinations of flavors of your choosing. The smallest box was for 12, so we decided to get a box of twelve to take home with us. 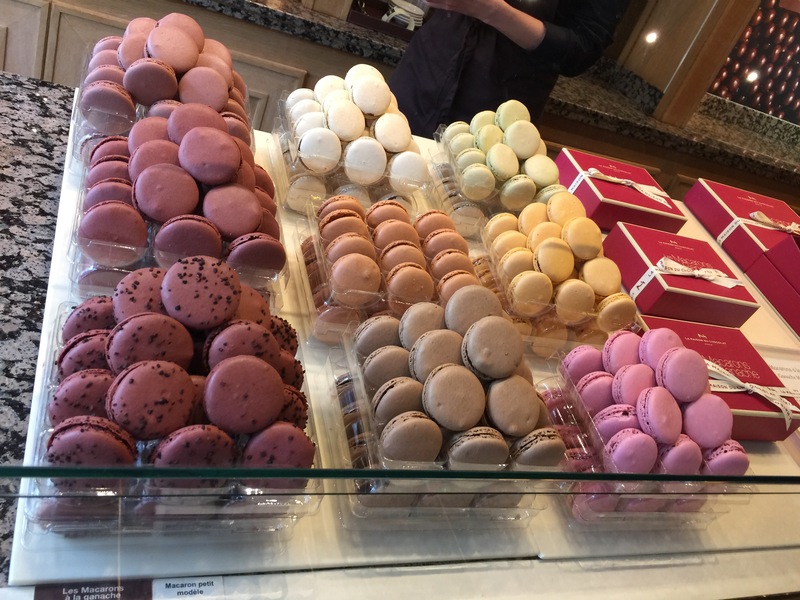 As they only offered 9 different flavors of macarons, we had to choose a couple of flavors to take multiple of so that we could get to the 12 we needed. We definitely requested that they give us a couple of the Maracuja, which is passion fruit pulp with dark chocolate ganache. We loved the Mogador at Pierre Herme so much we wanted to try La Maison’s version of passion fruit. While the Maracuja was delicious, it was definitely more dark chocolate ganache than it was passion fruit, and we definitely wished that the passion fruit was more intense and more defined. The Malaga, which is sweet Corsican citron in a dark chocolate ganache with lemon zest was tangy and delicious. There was a Venezuela which used pure origin dark chocolate from Venezuela with spicy cocoa notes. The Rigoletto was made of creamy chocolate ganache mixed with silky caramel and sea salt. The Macapuno featured dark chocolate ganache mixed with a hint of lime for tanginess paired with a sweet coconut cookie. The Salvador was the traditional raspberry cookie with the raspberry cream inside. And the Romeo, roasted Arabica coffee mixed with half dark chocolate and half milk chocolate ganache. The macarons were definitely tasty. However, in comparison to Pierre Herme, my husband and I agreed that we both liked Pierre Herme better. The cookie that makes up the macaron at Pierre Herme was tastier and of better consistency, crunchy on the outside while remaining soft and creamy on the inside and overall the flavors of the filling of the ganache were tastier with the Pierre Herme macaron as well. Sadly, we didn’t try any of La Maison’s truffles or chocolate bars, and we probably missed out by not trying it. As I mentioned, the store was so minimalistic in its design that it was really hard to get a feel for what kinds of truffles, bon bons and chocolate bars they offered, and as we were in a hurry to pick up some chocolates and leave, we didn’t spend any time browsing through the store’s entire chocolate collection. However, we did notice that in the front window of the store there was a display of various pastries that included cakes, tarts and eclairs. Being a true lover of eclairs, I couldn’t leave without buying an éclair to try back at the hotel. And being the follower, my husband decided to get an éclair as well. We ended up with a chocolate and mocha éclair. At this point, I had no idea that La Maison was well known for their chocolate eclairs, so it was rather fortuitous that we had even gotten an éclair. The chocolate éclair was for my husband, the mocha for me. I’m a chocolate fan, but when you add coffee or mocha to anything chocolate, that will always grab my attention. 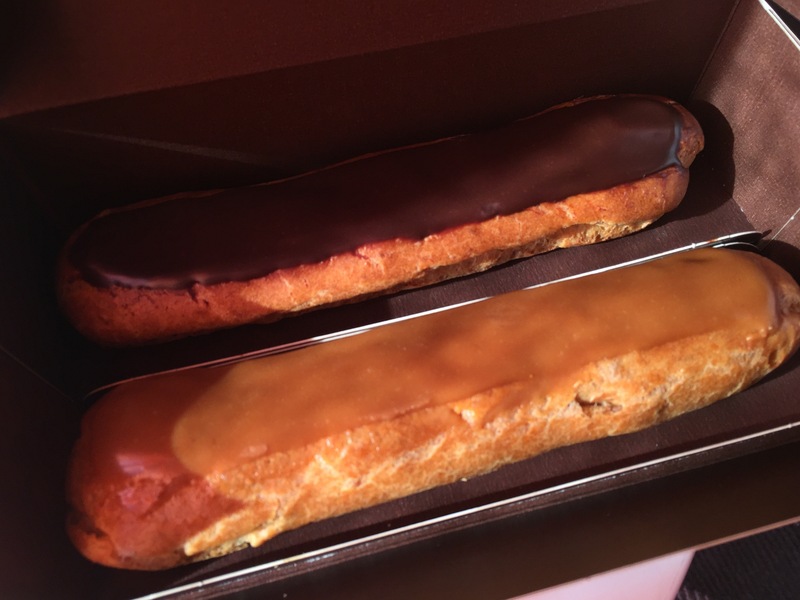 My husband and I both agreed that the eclairs were delicious. The choux pastry was light and soft and perfectly baked to be chewy. The filling inside, the chocolate for my husband, mocha for me, was rich and delicious. There was just enough filling to provide sweetness to the desert, but not so much that it overwhelmed the éclair or detracted from the flavor of the pastry and the glaze atop the éclair. 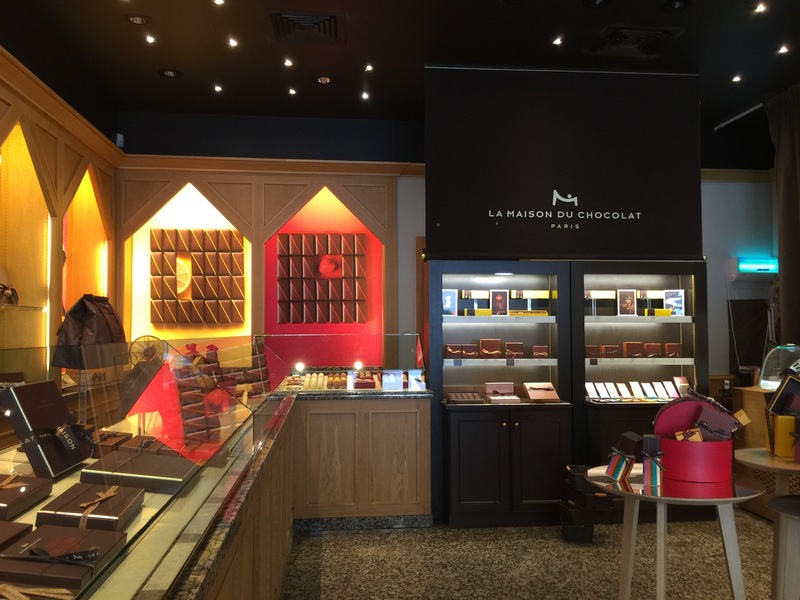 Overall, our review of La Maison du Chocolat was mixed. The macarons, while delicious in their own right, and with good flavor, just couldn’t stand up to the macarons we picked up at Pierre Herme. And while it might not be fair to compare one chocolate shop to another, it’s kind of hard to when you visit so many good chocolate shops on consecutive days. The taste and experience from shop to the next lingers and you can’t help but compare what you’re currently enjoying to what you enjoyed previously. 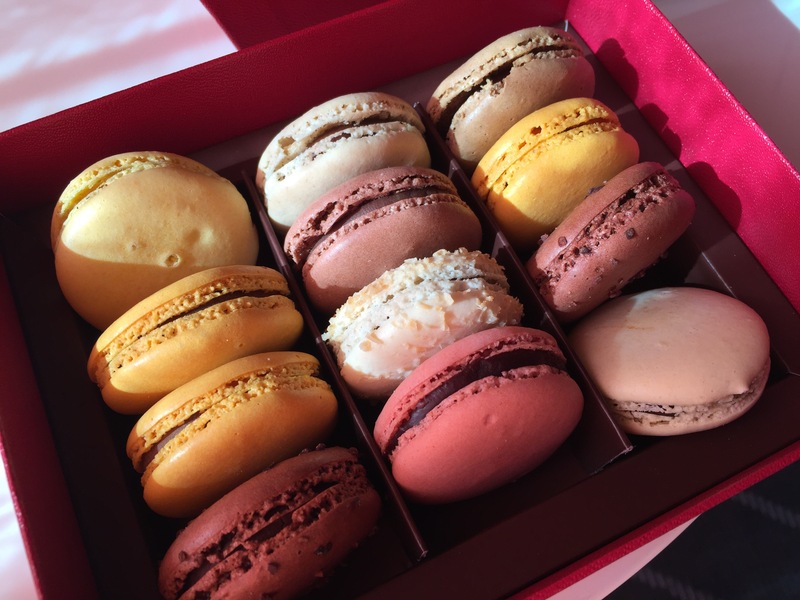 So, while La Maison’s macarons and eclairs were delicious, this was more of a case of, “…I’m glad I tried it, but if I had to pick one to go back to, it would be Pierre Herme.” And believe me, we did go back to Pierre Herme.